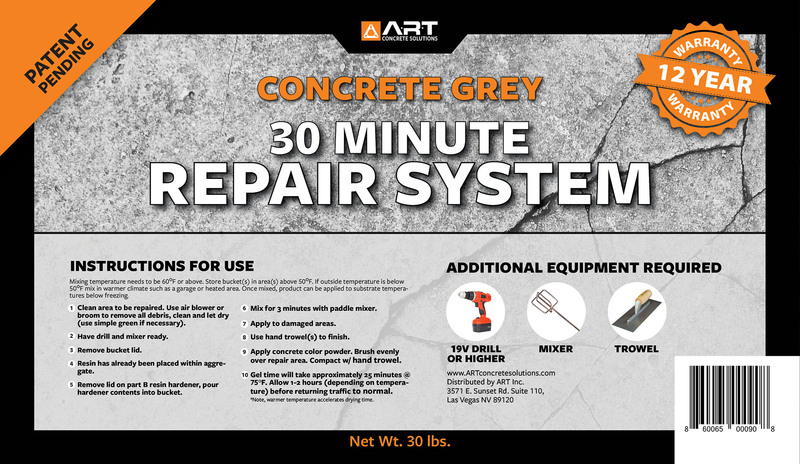 The 30 Minute Concrete Repair is a fast, effective method of repairing damaged concrete with minimal down time. No remove and replace needed with the 30 Minute Repair. Traditional concrete repair requires the complete removal of the damaged area, while our solution repairs the existing structure. Once the repair is completed, you can restore the area to full service in less than 60 minutes. Concrete Solutions is proud to present a process and product that is a decade in the making. has spent the last 6 years researching, testing and creating a stronger and more efficient way to repair concrete. The 30 Minute Concrete Repair System (DIY Bucket) allows anyone to repair their own concrete area. From minor cracks to major fixes, ’s 30 Minute Concrete Repair System allows you to make the repair and avoid the hassle of contracting the repair out or dealing with other products that might be weaker and take longer to cure. Have confidence in using a product that is 4X stronger than traditional concrete, withstands a full-range of climate variables and was selected best in class by the FHA in 2011. I was skeptical about this stuff really working, but it did great. I'll always keep one of these buckets in my garage, you never know when you'll need it. I've been in the concrete industry awhile, and I've got to say, this stuff cures way faster than concrete. In a pinch it's great. This repair bucket was awesome! I was able to repair my driveway and get my house sold without any costly repairs. Thanks! First, the repair area is prepped by removing any deteriorated and damaged concrete. The area must be cleaned of any loose debris before application can begin. It’s important to give the concrete solution enough depth to anchor the surrounding structure. Once the loose concrete has been removed, the unfinished cracks can be ground down to allow for a more thorough bonding of the repair. Use leaf blower or broom to remove all debris, clean and let dry (use simple green if necessary). 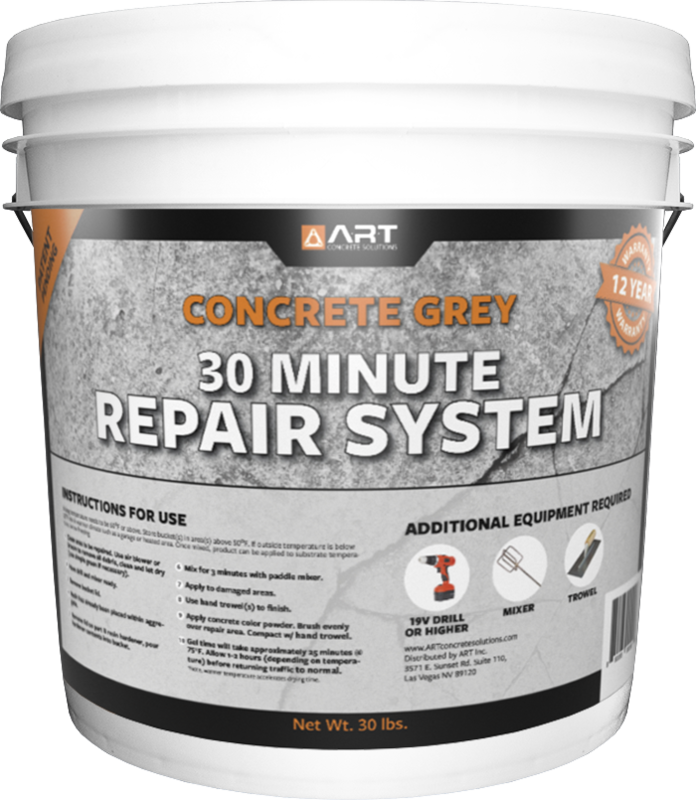 The 30 Minute Repair product is a patent pending polymer Hybrid Composite concrete repair formula. After years of extensive research is pleased to provide this unrivaled product. It comes packaged in individual pre-measured bags to allow for an easier mixing process. Simply add all the ingredients into an induction mixer and in 3 minutes the repair solution will be ready to apply. The 30 Minute Repair is 4x stronger than concrete and is ready for returned use in minutes not days. The third and final step is to apply the mixed material to the repair area. This is where the material is spread out, leveled and finished with a hand trowel for the appropriate thickness and slope. Then the material is dusted with a powder to best match the color of the surrounding area. After the simple 3-step concrete repair process is complete, you only need to allow approximately 60 minutes for the material to cure*. At this time, you will be able to walk or drive on the repaired area. *Final cure time may vary depending on outside temperatures. Exposure to silica dust can cause severe, irreversible lung damage and death. Some medical reports state inhalation of silica dust may cause cancer. Medical reports also link breathing silica dust to crippling arthritis and skin and eye irritation. Fine silica dust is nearly invisible. Work areas must be thoroughly ventilated. Consult OSHA for acceptable ventilation standards and practices. Silica dust can also be harmful to your eyes and skin. You need sufficient protection from exposure to silica dust. If eye contact and irritation takes place, flush your eyes continuously with clear cool water for at least 15 minutes and then see your doctor for treatment. Review and thoroughly understand all health precautions outline in the material safety data sheet (MSDS) provided by your employer or the supplier of this material. It is a violation of federal safety laws for employers to require workers to use this material without full respiratory protection. Please consult OSHA for safe workplace standards. Have shortness of breath, coughing, lung and/or throat irritation. Have swelling of the joints and/or joint pain. Have eye and/or skin irritation. These are possible symptoms or problems developing from silica exposure. Western States Wholesale is making no recommendation for the use and purpose for which this product may be utilized. No guarantee of results are made as the conditions of installation are beyond out control. No representations or warranties, either expressed or implied, are made with respect to this product and its uses beyond the description on the face hereof, and in particular there are no implied warranties of merchantability or fitness for a particular purpose. Under no circumstances will Western States Wholesale be liable for consequential damages, or any damage in excess of the purchase price of this product. Western States Wholesale, as blender of processed material in the State of California, we are required by Proposition 65 to warn that one or more of the components in this product contains chemicals known to the State of California, to cause cancer, birth defects, or other reproductive harm.